"It s rare to find a storymuch less such a short onethat offers this kind of pleasure and manages to linger in mind as an unsolved mystery ... as exciting as the best daydream you ever had. ""The Second Pass"
"Zambra s sentences string together like pearls, each of them perfect, fragile, and self-contained. Often, they are startlingly beautiful in their careful starkness, or hilariously deadpan ... Trees has a wry sense of remove. It washes over you, and it lingers. 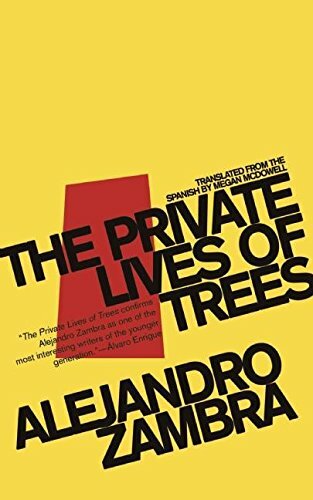 "Rachel Sugar, "New City Lit"
""The Private Lives of Trees" is a novel from Chilean writer Alejandro Zambra, masterfully translated by Megan McDowell ... Poignant and thought-provoking, "The Private Lives of Trees" is a fine piece of international fiction. ""The Midwest Book Review"
" Zambra writes peculiar books that work on many levelsthe kind to be read again and again because they become something different each time. ""Tottenville Review"
"Alejandro Zambra is certainly the most interesting Chilean writer to emerge since Bolano died in 2003 ... his biggest strengths [are] a lively attention to detail and an ability to plausibly, enjoyably break the binds of tradition..."Stephan Delbos, "The Prague Post""
Worried that his wife Veronica will not return home from an art class, Julian imagines his stepdaughter Daniela's future without her mother and tells her an improvisional bedtime story.